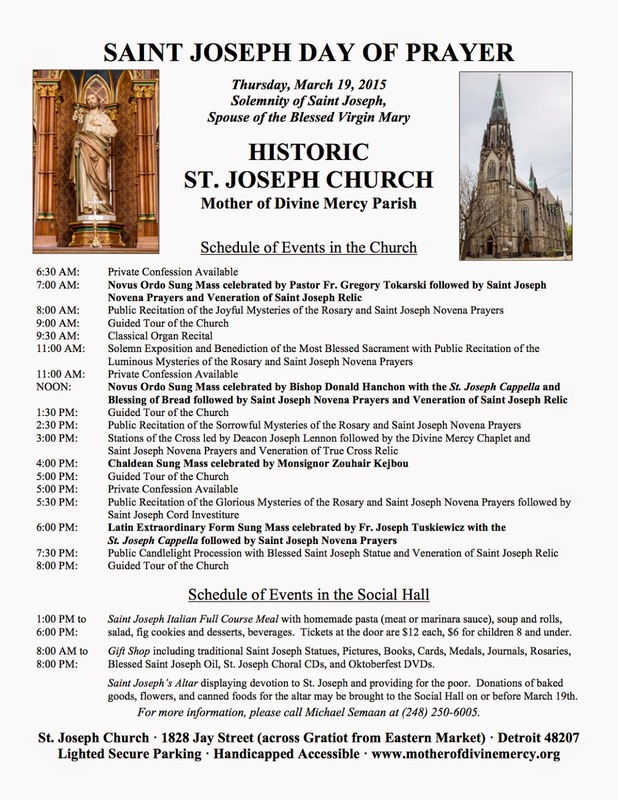 Historic St. Joseph Church, Mother of Divine Mercy Parish in Detroit will hold an all-day St. Joseph Day of Prayer on the Solemnity of St. Joseph, March 19, 2015. The day includes four Masses, Confession, devotions, an organ recital, church tours, meal, and St. Joseph's Altar providing for the poor. Music for the Noon Novus Ordo Mass includes Missa Rosa Mystica, Carnevali; Ave Maria, Bonnet; O taste and see, Vaughan Williams; Laudate Dominum, Mozart; Gregorian Chant Propers. For the 6pm Extraordinary Form Mass the music includes Missa Collegium Regale, Darke; O crux Ave, Palestrina; O quam gloriosum, Victoria; Ave verum corpus, Byrd; Gregorian Chant Propers.